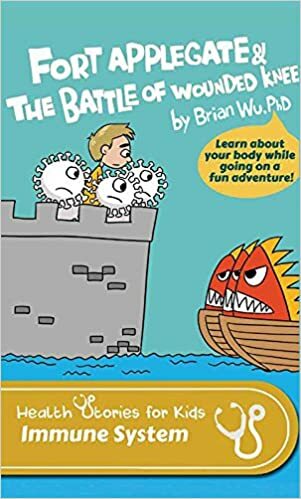 Fort Applegate and the Battle at Wounded Knee by Brian Wu, Ph.D.
Synopsis: Nolan Applegate is a young boy who is out looking for the perfect place for a fort. He explores the forest behind his house and reaches a stream. The stream is shallow enough that he could walk through it and only get his waterproof boots wet. But, like most of us have done in the past, he makes it a game to get across the stream without getting wet. It is on the way back that the “Battle” begins. Nolan slips on a rock while crossing the stream the second time and lands in the stream. He skins his knee and bacteria get into his body. The rest of this cute story is about how his body goes about attacking the germs and how he helps his body fight off the germs.